It's hard to find a better value than this 357 Magnum case from Fiocchi! It carries a 142 grain full metal jacket with a truncated cone. The flat point is sometimes preferred by target shooters as it should leave more consistent holes in the target. 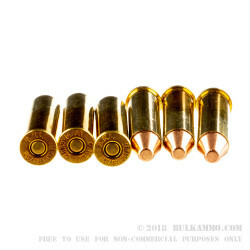 The .357 Magnum caliber ammunition in FMJ has excellent penetration and is a very economical round for target ammo, or hunting. 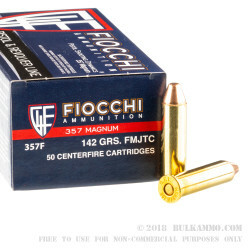 Fiocchi has been building quality ammunition on the east side of Lake Como in Lecco, Italy for nearly 150 years. Now production is split between the original factory and the Fiocchi of America plant in Ozark, Missouri. 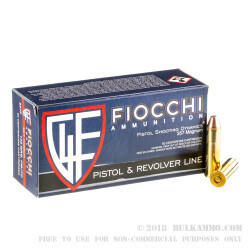 The US factory produces about 75% of center-fire pistol ammo sold in America.Giulio Fiocchi's initials form the recognizable Fiocchi ammunition logo. The Italian family business employs Giulio's great-great-grandchildren today! All around good ammo. Price could improve some. 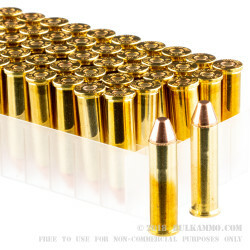 Q: Would this ammo be safe to use in a tube feed henry lever gun? A: Since the ammo has a flat-top bullet it should be fine in a lever gun. Best to avoid pointed projectiles in tubular magazines.